I live a couple of blocks from one of the great cultural institutions in Chicago ... the Newberry Library. Every summer they have a famed Book Fair that runs Thursday-Sunday, and on Saturday there are the "Bughouse Square Debates", which honor the history of little Washington Square Park (on which Newberry Library fronts) as a "speakers corner" back in the day. In fact, as I understand it, this tradition is enshrined in the city regulations as being the only park where one can have public gatherings without any sort of licensing, and that the only requirement to give a talk out there is that one has to be on a raised platform (such as, classically, a "soapbox"). There are several elements to the program, with a lot of the focus being on a formal "debate" between two (sometimes quite contentious) speakers on some topic, generally of civic import ... this year's subject being "Is Chicago Broke?". Over there <=== is a shot of the Tribune's Rick Kogan MC'ing the festivities (click for bigger). Kogan took over the gig following the death of his friend (and local journalistic legend) Studs Terkel, and he always has some fascinating tales to tell about the city. Among the stories he rambled through was how Studs insisted that Kogan bury Studs' and his wife's ashes in Bughouse Square ... when Kogan brought up concerns about the illegality of doing so, Studs said "let 'em sue us!" (fine for Studs, potentially less so for Kogan, I suppose). The debate this year was once again featuring a rep from the Heartland Institute going up against an "activist". Frankly, the crowd at the debates tends to the old-line hard-core (if not to say "lunatic") Left, and I guess the folks at Heartland are the go-to option for an opposing voice that's willing to work what is likely to be a hostile crowd. And, today the crowd was hostile ... while heckling is encouraged, the pro-union voices weren't wanting to hear ANY solutions to Chicago's long-term financial issues, and were making it very difficult for the guy from Heartland (who, honestly, was not the best presenter from there that I've seen) to make his case. It was so bad that I left half-way through to take a wander in the Book Fair for a bit. As those who bother to read my book reviews on a regular basis will recognize the Newberry sale as that source for "dead people's books" I mention on occasion. It's been less fun over the past decade or so when I've been too broke to swing through buying whatever looks vaguely interesting, but I do tend to pick up a couple of things on Sunday (when it's all half-price). 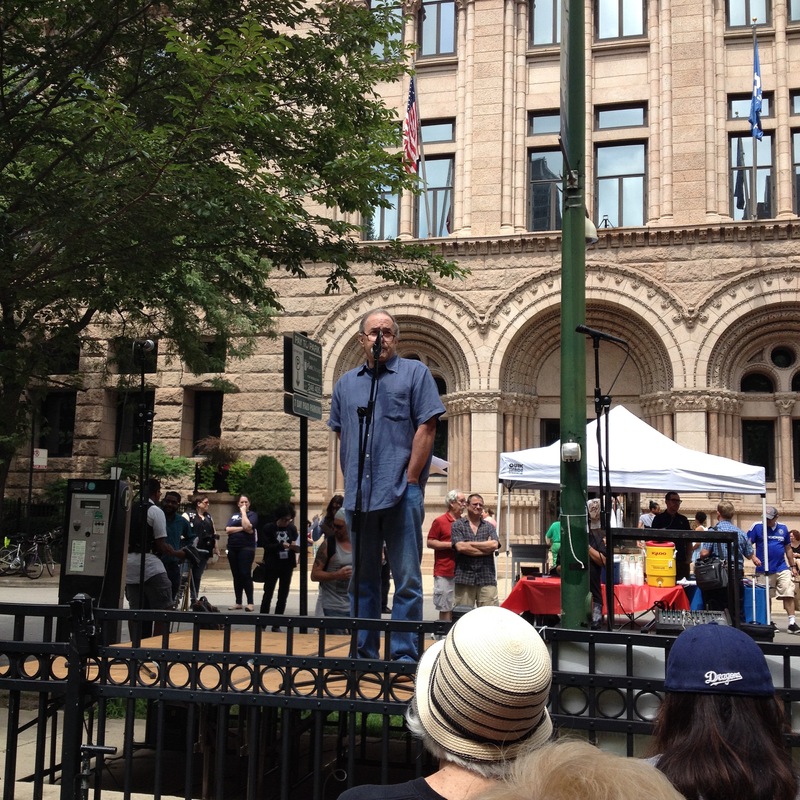 I returned to the park for the "soapbox" part of the event. 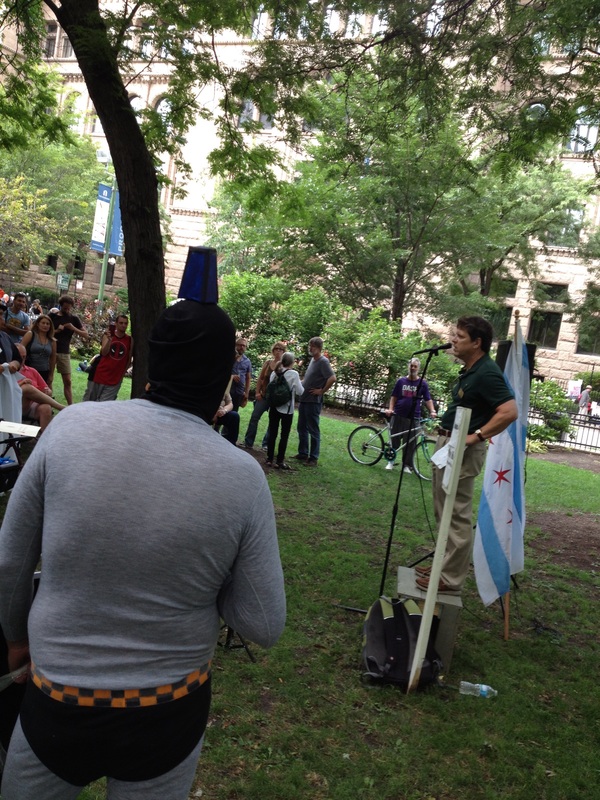 This year there were four stations set up around the north side of Bughouse Square, three with scheduled speakers, and one that was "open". While I primarily was targeting station #3, which had a couple of presenters that sounded interesting, I also caught a couple of things at the "open" soapbox. One of these speakers was Kent McMillen, the Libertarian Party candidate for Senate (pic over there ===>, click for bigger). His campaign had a table set up in the info area, and I'd had a chance to chat with him earlier in the day. Given the horrible choices of the main parties, I'm hoping that he might be able to get some traction this year ... I certainly am not going to be voting for the other candidates, and it's nice to have (as the LP often has not had a full slate of people running) him as an option. I was settling in over by the main stage to hear the results of the judging, when I noticed that a long-term acquaintance of mine (who I'd run into earlier), David Dalka, was up on the "open" soapbox. I circled back to there, and caught the last part of his talk. He's started up a consultancy called Fearless Revival, which is in reaction to the huge global consulting groups that outsource functions away from the clients' home markets to workers who are not necessarily in touch with the actual situations being addressed, or particularly well trained to produce useful results (hey, like hiring somebody in South-East Asia to write stuff for 1/20th or so of what it would cost here - cough, cough - for a local pro's efforts). One of the "advantages" that David had up on the site for using their services really caught my eye: "Protecting you from harmful misinformation, unreality and groupthink in society" ... certainly something that a LOT of organizations need! As Rick Kogan noted in the closing bits, it certainly was one of the nicer days for this event in recent times ... while it was hot and humid, it wasn't too hot, and there were intermittent cool-ish breezes, making the afternoon less of a trial than it has sometimes been, plus (despite earlier forecasts of thunderstorms) it didn't rain, which is certainly a plus.